Women's Small Batch L.L.Bean Boots, 8"
Signature Retro Colorblock Waxed-Canvas Bean Boots, 10"
Women's Small Batch L.L.Bean Boot, Flowfold 6"
Women's Maine Hunting Shoes, 10"
Women's Small Batch L.L.Bean Boots, Chelsea 7"
Often imitated, but never duplicated, L.L.Bean Boots for women have been keeping feet dry for generations. Designed by L.L. himself in 1912, this revolutionary footwear combined soft leather uppers with waterproof rubber bottoms for the ultimate in comfort and performance. 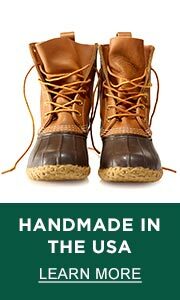 Today, L.L.Bean duck boots for women are still handstitched, one pair at a time, in Brunswick, Maine. And theyre still made with the same authentic details like triple-needle stitching, premium full-grain leather and a rugged chain-tread bottom that have made them classics. While many duck boots for women might look similar, they lack the attention to detail and the quality materials that have allowed ours to stand the test of time. Over the years, our line up of Women's duck boots has grown to include insulated duck boots for winter, duck boots with fur, lace-up boots, moccasins, lined duck shoes and more all with the same quality craftsmanship as the originals.